Management of Purchased Services in healthcare is the biggest cost savings opportunity for hospitals today. In order to reduce your hospital’s purchased services spend, you must adopt new and innovative practices for cost reduction, which include: reconciliation of your line item service invoices, identification of cost reduction opportunities through price and cost benchmarking, extensive contract reviews for a complete understanding of financial and operational costs, as well as a data driven analytics and spend analysis from your invoice details. It doesn’t matter what system or process you use, if you don’t have automated visibility and access to your purchased services invoice line item details – you are missing cost savings and overspending. In this article and the within the executive report below, VIE Healthcare will give you insights into your purchased services transactional data so you can achieve unparalleled cost savings in record time. Learn from 20 Years of Purchased Services Line Item Analytics – The Power of a Proven System – Which Captures Hidden Costs, Automates the Reconciliation of Complex Monthly Invoices, Analyzes Utilization of Invoice Line Item Details and Drives Deep Cost Savings & On-Going Management of ALL of Your Purchased Services Spend. Hospitals and health systems are under an incredible amount of financial pressure. As costs continue to rise, hospitals are faced with improving patient care while closely examining costs in a way that they never have before so not to impact care. Because of this, it is critical to eliminate potential inefficiencies and financial gaps while still positioning for future growth and quality of care improvement. Purchased services are a large expense for hospitals and it is growing even further as hospitals are continuing to outsource non-core activities to third party companies and also with the significant growth in healthcare IT services spend. By definition, purchased services is any service contracted for, and performed by, a third party rather than a hospital’s in-house employees. These purchased services span all departments across the entire health system from financial services to laboratory services to clinical services. The acquisition of purchased services – of the right qualities, in the right quantities, at the right prices, at the right time – has gotten the attention of many healthcare leaders. Organizations are finding the need to change their purchased services analysis from a process-oriented function to a strategic one in order to achieve best pricing and contract terms with optimized utilization. Without the line item details for the services you utilize by each purchased services vendor you are relying only on purchased services total “category” data. Since services are utilized then invoiced—your hospital depends on the purchased services vendor to invoice accurately. Yet, after 20 years of purchased services cost reduction consulting – we see that greater than 30% of all purchased services invoices are priced incorrectly from the agreed upon contract terms, are not on contract or have excessive extras fees added. This requires someone from your hospital, usually a department director or a clinician, to manually review pages of invoices and hundreds of line items for accuracy and also utilization improvement opportunities. Since this process is all manual and resource intensive, many of the purchased services invoices do not get thoroughly reviewed with errors and opportunities being missed each month. And when your hospital is ready to review your purchased services agreements for contract compliance or for cost savings – how do you obtain details of from your historical 12-18 month line item detail of your services spend? Unless your organization utilizes VIE Healthcare’s patent pending technology Invoice ROI™, the only way to access your purchased services line item details is manually. The video’s below will give you a high level explanation of how Invoice ROI™ works, and will show you how this patent pending technology, gets right to the line item details providing hospitals with more data for cost reduction than ever before. VIE Healthcare’s approach to reducing your purchased services spend is unmatched in the industry. Our approach is based on analyzing line item purchased services details. VIE Healthcare gives you the insights into your purchased services transactional data so you can achieve unparalleled cost savings. 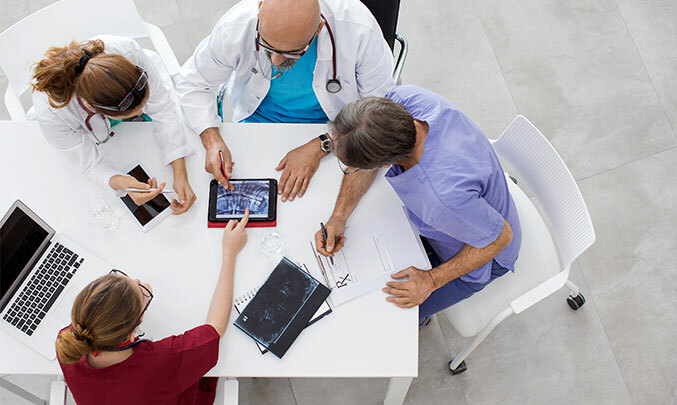 VIE Healthcare provides hospitals with a proven purchased services cost reduction strategy and guaranteed results from our implementation services. We engaged VIE Healthcare to assist us in evaluating and reducing our purchased services spend, a growing segment of our operating expenses. 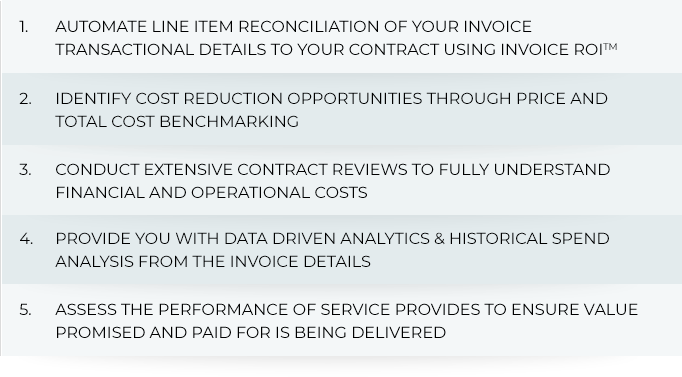 Their patented methodology to compare actual spend to contract spend, using line-item invoice detail, helped us recover hundreds of thousands of dollars related to inaccurate billing. Further, they’ve been responsible for well over a million dollars in savings by partnering with us to evaluate our rates against market rates for services, ultimately leading to re-negotiated terms with our vendors. This all happened within the first 6 months of the engagement.